Technology | Carnahan & Sons, Inc.
We have always been fascinated by technology, and its impact on how we do what we do. You might say that technology comes in many forms: in our crops’ genetics, in mechanical things, and now with electronics. For example, dad began using hybrid seed corn as early as the 1940s. He was always looking for a way to increase production and drive down the costs. (especially drive down the costs!) He was probably not an ‘innovator’, but he certainly was an ‘early adopter’. Technology tools in our toolbox these days include advanced genetics, where the corn and soybeans have improvements that make them resistant to certain herbicides (glyphosate or Roundup) and also to many insect pests. This technology allows us to use more ec0-friendly herbicides, and eliminates our use of insecticides. Although the seed itself is more expensive, it reduces our costs, and improves our yields. And, with soybeans in particular, we get an intangible benefit, we can view with satisfaction the weed-free fields all summer long! How beautiful! We adopted a computer to handle our farm records in 1984. I can remember how excited we were to put that information in a digital machine, an Apple II+. It came with a green screen, and 64K of memory! How we thought we were in the space age! It was quite a leap forward, and expensive by today’s standards. We paid $3800 for the computer and the accounting software. I don’t think we ‘ve paid that much for a computer since. Today, we use a hosted version of QuickBooks, and I can sign on to it from home or the office, or anywhere for that matter. It is also available for our accountant to directly enter adjusting entries or payroll matters. I am very pleased with our bookkeeping system these days. Spreadsheets are also an important tool for this farm. Especially the ones we use to develop cash flow data, and crop budget information. These allow quick and easy analysis of different options, helping us maximize our financial returns. We spend a lot of time working and re-working these spreadsheets to more fully understand our finances and plan more adequately for the future. A new technology upgrade added in May of 2012 is our larger and more efficient grain dryer. We replaced a 1998-model GSI 2320 with a 2012-model GSI 2326. The model number shows that the dryer has 2 modules, 3 fans/burners, and is 26 feet long. It has a new internet-connected control system called “Vision” that allows John or Ross to monitor it or adjust the settings from a computer or smartphone. I will attach a screen-capture from the office computer showing the dryer processing wheat. Among other important information, it shows the temperature setting of the burners, the moisture level of the grain entering the top and exiting the bottom, and the amount of grain dried. You can see an image of the dryer on the left side; that image shows the loading and unloading augers moving, the fans operating, and when the on-and-off burners are operating, the fans turn from blue to red. A short video of this is on our YouTube site. A screen capture during wheat drying. You can see the grain coming out at 12.7% moisture. 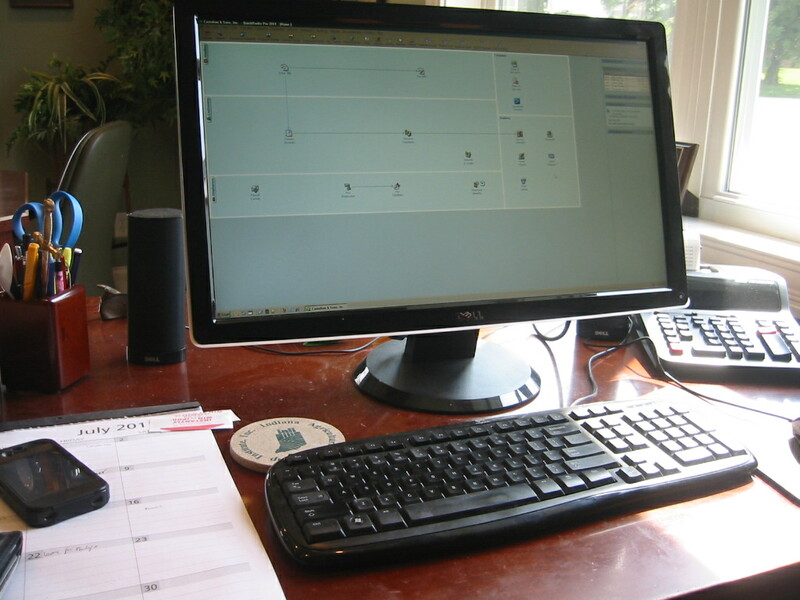 This was taken from the office computer, but the same information is available to Ross and John from their smartphones. And if a malfunction occurs while the dryer is unattended, it sends a text message to alert them. This information technology brings great value to the operation. In the fields, we also use GPS systems. Our main focus is with the John Deere Greenstar system, but we also use the CaseIH AFS system for red equipment that Ross loves to drive. 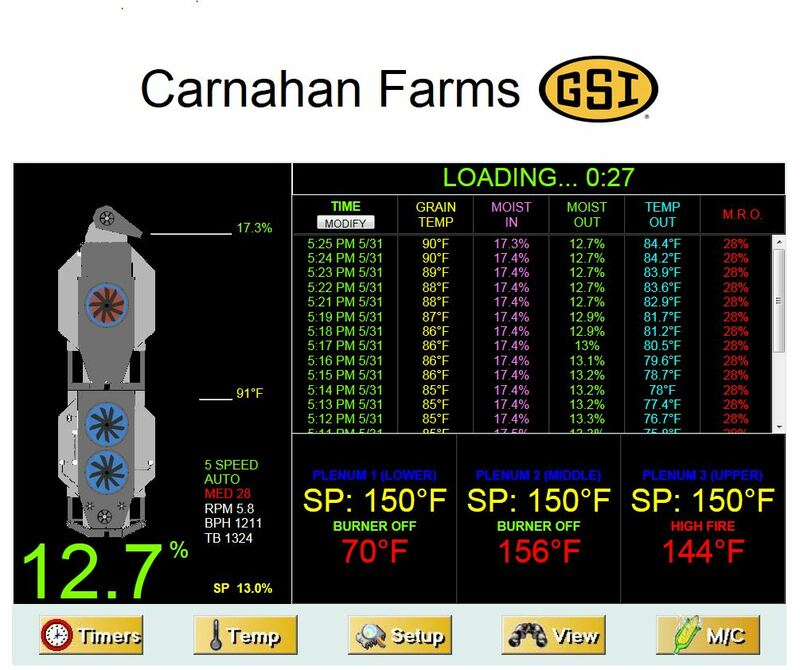 The two systems are not completely compatible right now; back when John Deere’s system was called JD Office, I could seamlessly import Case-IH’s Advanced Farming System (AFS) yield information. Now, with Apex, I cannot, but I understand that capability is coming in the future. Currently, we are in the process of moving all such information to a cloud-based system at MyJohnDeere.com. In 2016, we began with a new technology called “FieldView“. 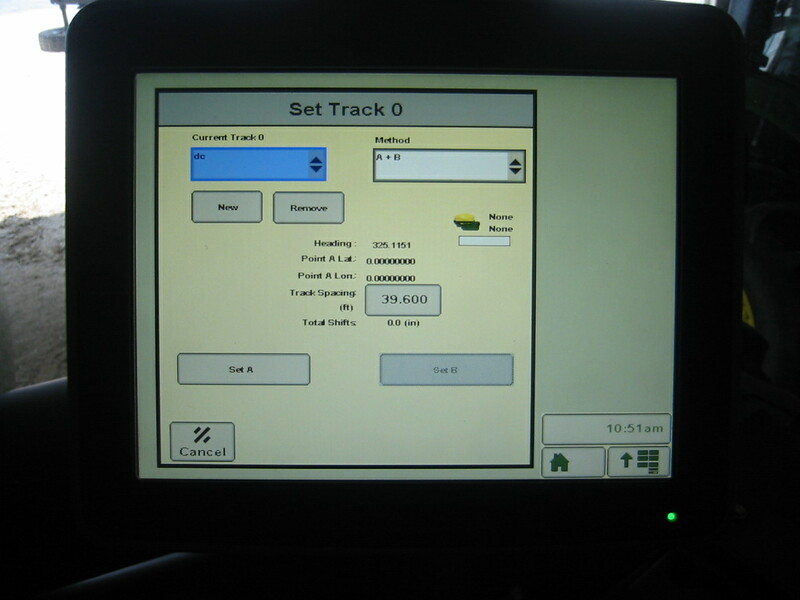 This system has a sending device that connects by Bluetooth to an iPad in each planting tractor. Using FieldView, we can combine the information from both our red and green information systems. This is our first experience with such a separate, cloud-based system, and has become the platform for which we’ve been searching that will blend together the Greenstar and AFS information! We use the Bluetooth devices and iPads in the combines in the fall, too. There are analysis tools in FieldView that can assist in management decisions. And we can share information in real time with our trusted agronomic adviser. With our yield information, generated as we harvest in the combines, I can evaluate the performance of each hybrid or variety. We can view the colorful maps on the screen in the combine as we harvest; each yield level is associated with a certain color. In harvesting corn, for example, I assign a green color to 220+ bushels per acre, with other colors assigned to yield levels 200-220, 180-200, 160-180, 140-160 and red is assigned to yields below 140. You can easily see the areas where yields are stellar, and those that are less impressive. Sometimes, the lower-yielding areas can be improved with some adjustments to management or the addition of drainage tile. But, we must recognize that each soil type has an inherent yield potential, that management or investment cannot as yet get beyond. Once I get the harvest information in the office computer, I can view the yield maps on screen, but I do not print them out like I did years ago. Now, our focus is on the yield reports, where each field and each hybrid or variety is listed. With that information, I can compare the relative performance of each in real-life conditions on our farm. It’s like our entire farm is a giant test-plot. Our earliest experience with guidance in the field was with ‘tramlines‘, beginning in 1993. At the time, we had a 30-foot soybean drill and and 60-foot sprayer. We moved over one row unit on the drill, at 60 inches from the left end, making wide rows 120″apart. When spraying, I would run the sprayer wheels in those wide rows, guiding me more accurately. In 2000, we moved up to a 36-foot soybean drill, and the tramlines were no longer feasible. So, we added our first GPS receiver and GreenStar screen to the sprayer, using a guidance system called “parallel tracking“. There was a little tractor icon on the screen, and if you moved too far left, it beeped once; too far right, it beeped twice. It was tedious! The same tedious guidance was utilized in the soybean planting tractor. 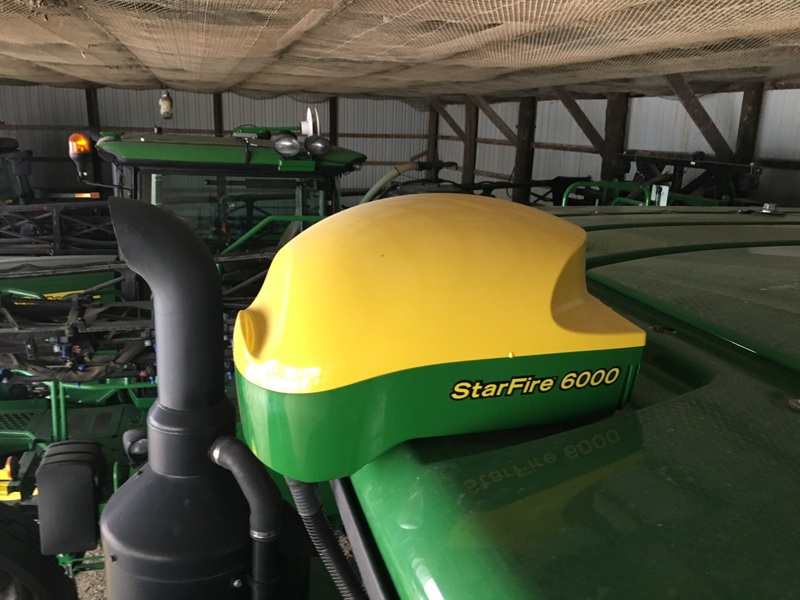 Most of our GPS systems are GreenStar-3 from John Deere. They have enhanced accuracy and are also capable of showing the operator video feeds from external cameras. We use that video to increase our vision to the rear when taking big machines down the highway. It’s hard to see those coal trucks zooming up on you behind a big planter or grain cart. Now we can see them coming, and it makes for greater safety. GPS systems rely on a view to many satellites. To read the location, direction of travel, and speed and many other factors, the GPS systems use a receiver, like this Starfire 6000 unit. It reads 8 to 15 satellites to determine its position. It communicates with the information in the screen, and controls many machine functions. All our tractors, combines, and sprayer are now equipped with automatic guidance systems, called AutoTrac. In the field or in the computer, we set up guidance lines, and the AutoTrac system takes over the machine’s steering to follow the track across the field. The operator takes back control as the machine approaches the end of the field, turns around the machine, and then clicks the ‘resume’ button for the next pass across the field. The GPS is a more accurate driver than any person, and it allows the operator to observe the performance of the machine more closely. It reduces operator fatigue, and allows for more hours with less weariness. We subscribe to a more accurate signal, the StarFire 3, which is accurate to + or – 1.2 inches. For the AFS system, we purchase an XP signal for the planting season, with accuracy to about 2 inches. The remainder of the year, the AFS uses the no-cost WAAS signal. There is a special software in the screen that is used in planting, spraying, and ammonia application. It is called ‘section control’. It minimizes overlap by shutting off smaller sections of the machine as it travels over previously applied areas, like in ‘point rows‘. This reduces our costs. 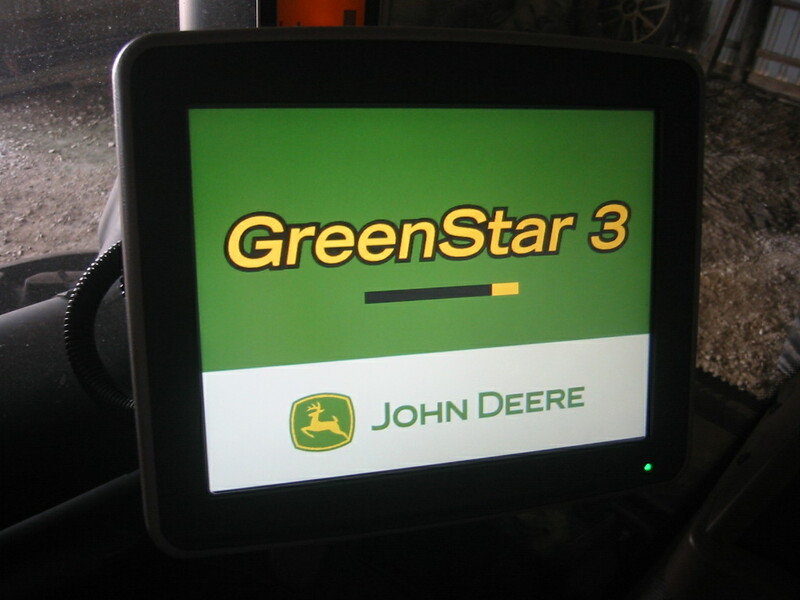 With the recent purchase of the JD 9520R tractor, we are now getting acquainted with Gen 4 — a GS 4600 display, John Deere’s latest version of interfaces between an operator and his machine. The GS4 screen is permanently mounted on the armrest of the 9520R tractor. This one has what is called a “premium activation” which includes –among other tools– section control and AutoTrac. It will be used by John to control the NH3 applications and also by Dennis to control the soybean planter. 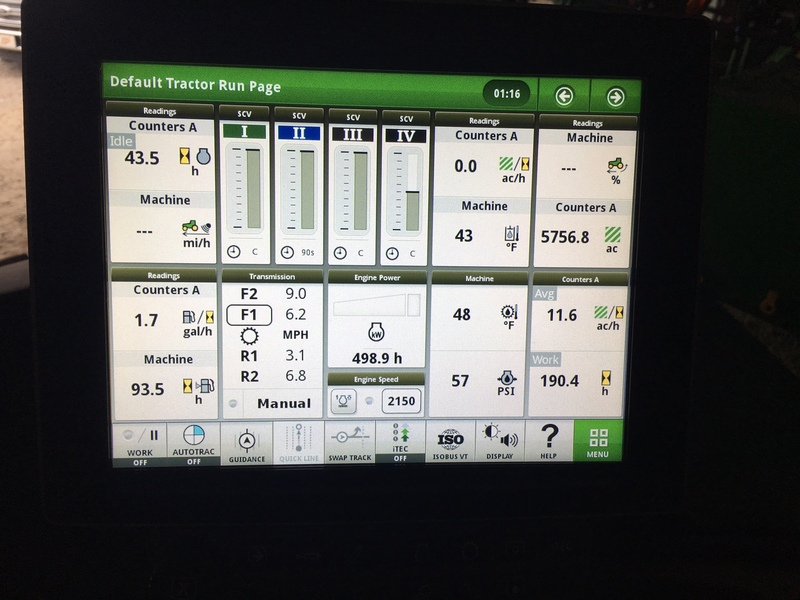 Here’s a picture of the GS4600 screen in the 9520R. You set up the view as you desire, and scroll through several pages of information on the tractor and its implement. We use prescriptions to manage our planters and fertilizer applications. In the office, we create prescriptions for each field based on soil types. 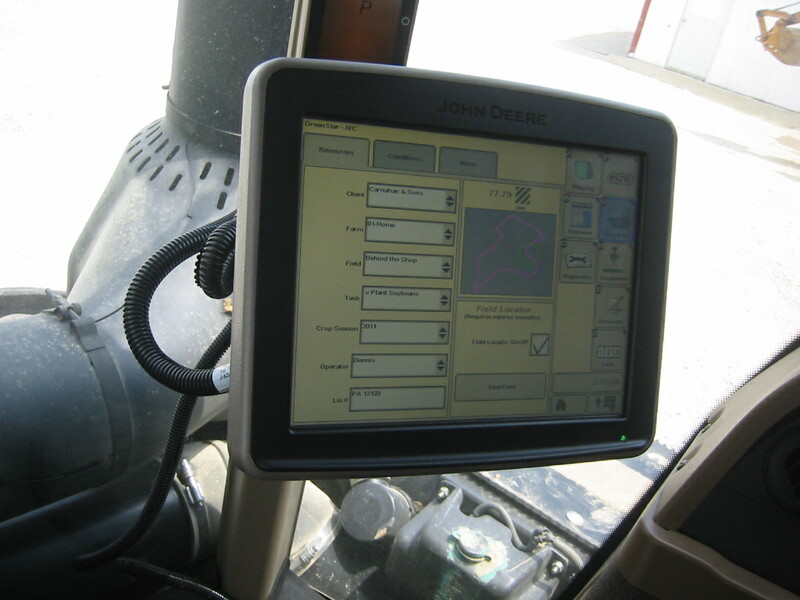 These digital maps are uploaded wirelessly to the GS3 systems in the tractors. As the planter moves through the field, the maps take control of the rate system. It reads the location and sets the planting rate. This feature allows our planters to increase or decrease the rate of seeds per acre according to the soil type it happens to be driving over at the time. For example, in soybeans, we reduce the seed rate for higher-productivity soils, and increase the rate in lower-productivity soils. This has reduced our soybean seed cost by 10%. Similarly, the prescriptions improve our application of nitrogen, a critically important part of corn production. Nitrogen is a very expensive input and the variable-rate application method reduces our use of nitrogen by 12%, saving money and reducing the potential for N to find its way into the groundwater. When the tractors, sprayer or combines are operating in the field, the operation is being recorded in the on-board systems. That information is transferred to the office computer wirelessly. We can also monitor the operation of a machine remotely from the office, an iPad, or a smartphone by a system called JD Link. This also allows the dealer’s service department to analyze any problem from their location… and this usually resolves the problem. But if a technician is required work on the machine in the field, the system also gives the technician directions to find the machine’s location. We can also upload field and boundary and other information wirelessly to the machines. 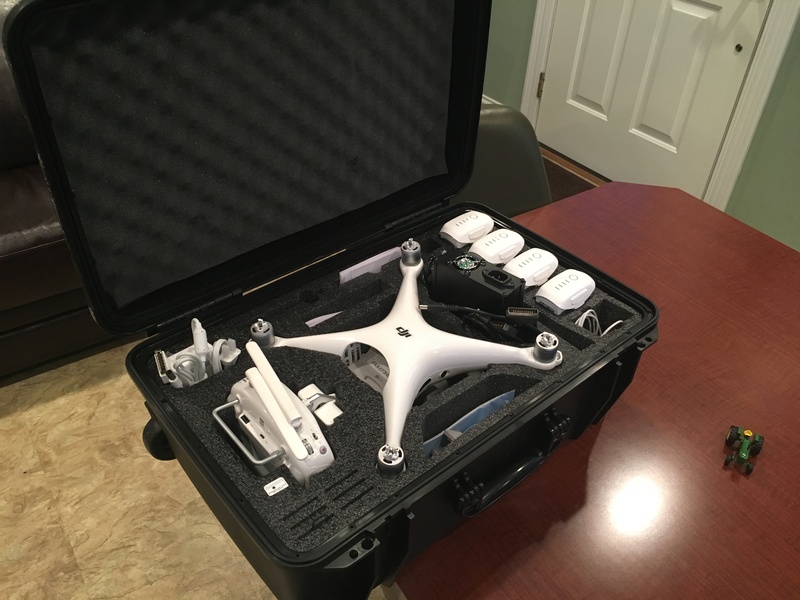 We have recently upgraded to our second-generation unmanned aerial vehicle (UAV) for the farm. 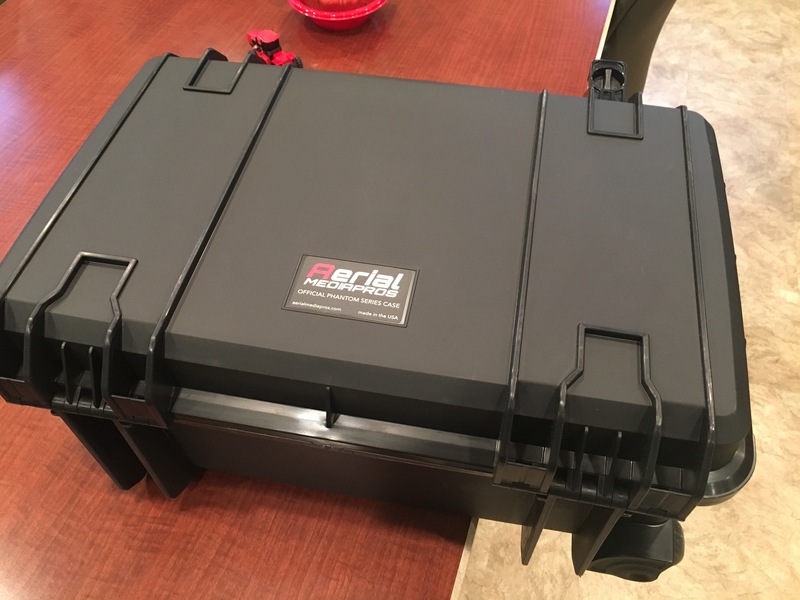 We have a good case for the new UAV, making it simpler to transport and store. Here is John preparing to fly the drone using the Drone Deploy programming. It’s neat to watch this fly back and forth– automatically, and without input from us… then it returns and lands at the point from which it took off. 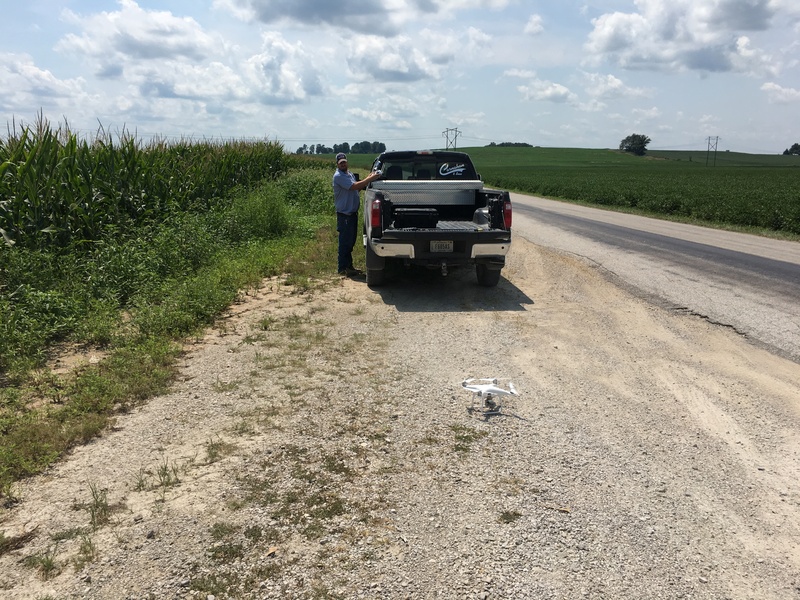 This UAV, some would call a drone, has some important capabilities to view our fields and crop conditions from above. This should improve our monitoring during the growing season. And… we hope to get some great photos and video of our field operations. We have been experimenting with a photography service called Drone Deploy. We give that software a digital field boundary, and then it takes control of the drone to fly a specific pattern over the field while taking photos. We upload that series of pictures to DD, and they return to us a NDVI image of all those ‘stitched together’. That way we gather an NDVI image of that field. It’s a little cumbersome, but gives us good information on any field for which we have a question. We seem to always be on the lookout for new methods and technologies. It must, of course, be more than a novelty, but have the promise of lower costs, improved efficiencies, increased production or enhanced operator convenience. When we look back over the years, it is an amazing thing to think about the technological advances in farming. Our Grandpa, Welker Carnahan, used horses in his farming, and at the end of his farming life he was driving a John Deere 55 combine. His 55 would cut a swath of wheat or soybeans ten feet wide, or harvest two rows of corn. Today, the combines cut 40 feet of wheat or soybeans and 12 rows of corn! Since dad started in 1937, he also used horses, but added tractors as soon as it was feasible. He told us his first corn planter, a used 2-row model, cost him $2. He drove his Model T truck to the next county to bring it home. In those early years, each fall and winter, mom and dad harvested corn by hand, maybe getting two 60-bushel wagon loads of ear corn a day. Family legend tells that mom was a better corn ‘shucker’ than dad. He passed on in 1999, before we adopted GPS systems. I think if he were around today, he’d be fascinated to see all the electronic control and guidance systems, and he’d be proud of the efficiencies they gain us. And we think he would be startled to know about those $400,000 tractors and $600,000.combines! I don’t think we can fully imagine today what our next generation of farmers will see change in their lifetimes! Will it be as dramatic as our experience?